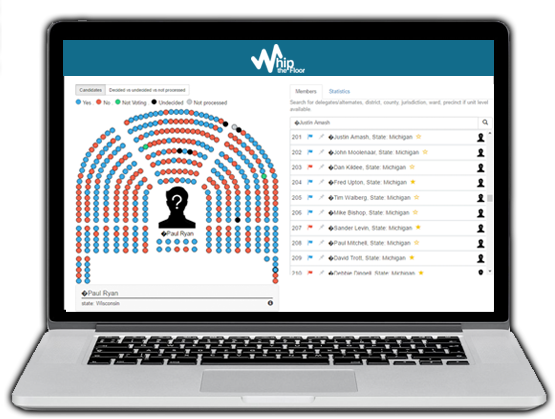 Predicts and live tracks the vote count for an upcoming floor assembly convention in real time. Upload data from a local device - cell phone, iPad, PC, laptop, etc... Upload data from the cloud if local device is connected to the cloud and offers upload capabilities. To upload data, the user drags and drops a CSV file inside the designated file upload area or clicks on that area and then navigates to the desired file and selects the file. Error ! Incorrect file type! Only first 100 rows displayed! Ability to use the app for different convention types: permanent conventions like Congress sessions, State party conventions, County conventions, Jurisdiction conventions, Ward caucus conventions, Business election assemblies, Student elections, Local municipal elections, and any other assembly that uses Robert's rules of order or parliamentary procedures. The users of the app must be authorized by whipthefloor.com campaign admin to get access to campaign throught the app. String: Protesting is a waste of energy, working for a cause is not. Decrypted: Protesting is a waste of energy, working for a cause is not.